Economy Express is an express bus company that was established in the year 2000. The offices of Economy Express are located at Kuala Lumpur and Kulim, Kedah. As the company grows bigger and bigger, they are improving their service quality and providing more routes for their customers. The coach fleet deployed by Economy Express is either the standard 27-seater or bus with 30 executive seats. With essential facilities in the bus such as air-conditioning system, reclining seat, spacious leg room, charging port and television, Economy Express wants to make sure their passengers are able to experience a pleasant bus journey. 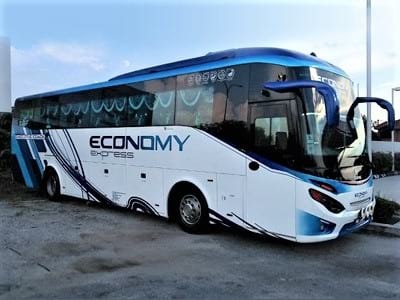 The most popular bus routes provided by Economy Express are from Kuala Lumpur, Kajang or Hentian Duta to Parit Buntar, Bagan Serai, Kulim, Baling or Sungai Nibong. By joining BusOnlineTicket.com, Economy Express is able to offer the online booking service for their bus services to everyone.